Google decided that a couple of weeks ago, it would end sales of the Nexus 6 by taking it away from the Google Store. That tends to happen each year when Nexus phones are about a year old and Google has newer products it would rather you buy. Thing is, that doesn’t mean these products can’t still be found elsewhere at incredible prices. The Nexus 7 (2013) can still be purchased here and there for rock bottom prices and it’s still getting updated! It has Marshmallow! The Nexus 6 will likely continue on thriving in the same way for years to come, even though Google is no longer selling it. So when you see deals like today’s at Amazon and you are need of a quality, quality smartphone at a hell of a price, you shouldn’t even hesitate about jumping on it. 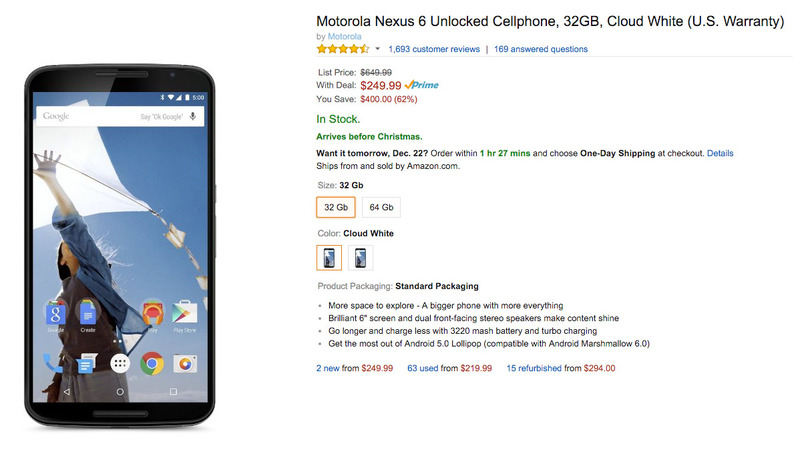 The Nexus 6 is currently $249 at Amazon for the 32GB model and $299 for the 64GB model. Remember, this phone originally retailed for $649. That’s a hefty discount.